Rashtrasant Tukadoji Maharaj Nagpur University has invited the applications for the 92 Teacher Vacancies under the Nagpur University Recruitment 2018. For that, candidates have to fill and submit the Offline Application Form on or before 16th August 2018. From this page, aspirants can apply for the राष्ट्रसंत तुकडोजी महाराज नागपूर विद्यापीठ Recruitment 2018 easily and also note down more stuff regarding the nagpuruniversity.org Eligibility Criteria, Application Fee, Pay scale and Selection Procedure with the direct link to download the RTMNU Official Notification. The complete article gives you the procedure to follow while applying for the Nagpur University Recruitment 2018. We have also incorporated the post-wise Nagpur University Job vacancy details with the Age limit. Grab the complete information about the Nagpur University Recruitment 2018 from the above table. Furthermore, we have gathered all the information from the official site of the Rashtrasant Tukadoji Maharaj Nagpur University and framed in the above table. 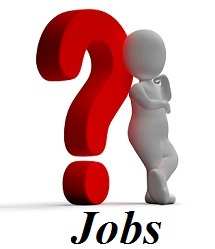 So, it contains the name of the organization and the post name and the number of vacancies available for the openings. And also you can note down the official site address with the selection procedure with the application form dates, exam date, and even the application mode. Check out the Vacancy Details for the Nagpur University Recruitment 2018 in the current section. Candidates who satisfy the below eligibility criterion can only have the entry to apply for the released Nagpur University Recruitment 2018. Assistant Professor: Good academic record with at least 55% marks at the Master’s Degree level in a relevant subject. The candidate must have cleared the National Eligibility Test (NET). Assistant Professor in Pharmaceutical Sciences: A primary degree in pharmacy (B. Pharm.). The registration as a pharmacist under the applicable Pharmacy Law. First Class Master’s Degree in appropriate branch of specialisation in pharmacy. Assistant Professor in Education: A Master’s Degree in Science/ Humanities/ Arts with 50% marks. M.Ed. with at least 55% marks), and The candidate must have cleared the National Eligibility Test (NET). Chemical Engineering & Chemical Technology in Laxminarayan Institute of Technology: First Class Master’s Degree in the appropriate branch of Engineering & Technology. Age Limit – Candidates should have the age in between 18 years to 45 years to apply for the Nagpur University Recruitment 2018. Check the given official notification for any other information regarding the age limit and also for the post-wise age relaxations. 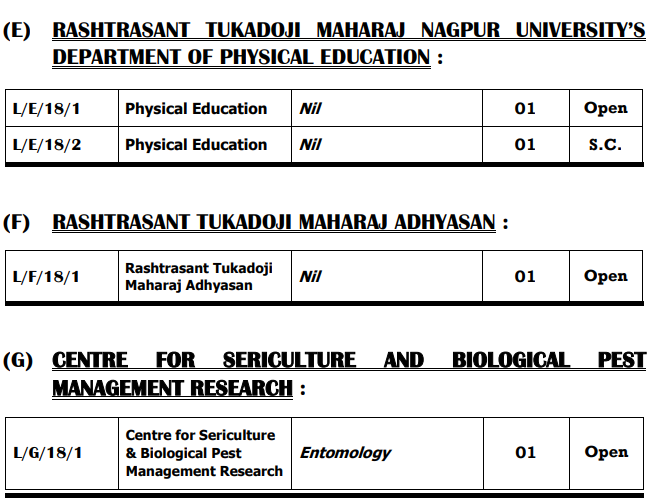 Candidates who grab the position of the Teacher at the specific departments, for them the officials of the Rashtrasant Tukadoji Maharaj Nagpur University will give a high payscale of INR 24000. And also they will offer a hike to the candidates based on their performance. For the applied candidates, initially, the officials will perform the screening test. Then they will conduct the Personal Interview. With the performance of the candidates in the procedure for the राष्ट्रसंत तुकडोजी महाराज नागपूर विद्यापीठ Recruitment, the officers will allow them to the further process. Candidates should follow each step to move in the right way in applying for the Nagpur University Recruitment 2018. 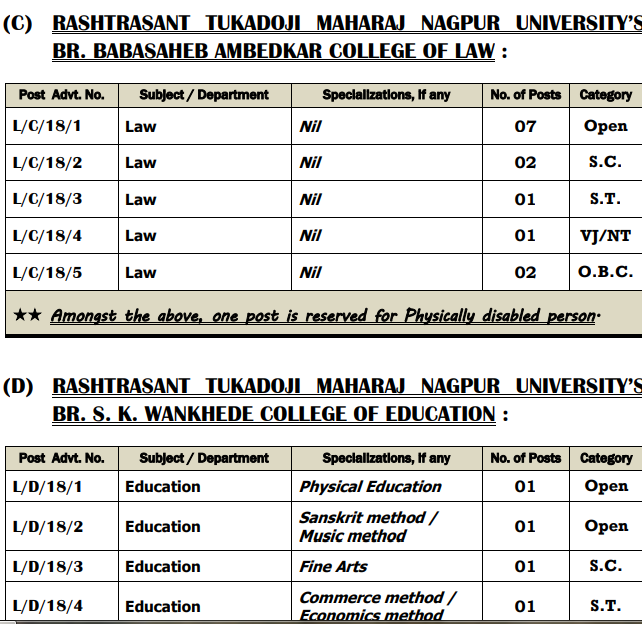 Visit the Official webportal of the Rashtrasant Tukadoji Maharaj Nagpur University @ www.nagpuruniversity.org. Candidates have to click on the “News/Events” section which is available at the right side down on the home page. Then all the applying candidates must click on the link for the “ADVERTISEMENT-Appointment of UNIVERSITY TEACHERS on Contractual basis” and also they can download the file. Also, for the applying to the Nagpur University Recruitment 2018, candidates have to click on the “APPLICATION FORM-Appointment of UNIVERSITY TEACHERS on Contractual basis” to download. Finally, fill in the application form and then send the form with attaching all the relevant documents. Up next, the duly filled application form in the prescribed format should be sent to the below address. Nagpur-440 001 (M.S. ), India” on or before 16th August 2018 05:00 PM. Candidates for any information regarding the Nagpur University Recruitment 2018, they can quickly visit our Sarkari Naukri website for the latest update.